Whenever I see these bakery-style meringues piled high in shop windows, it is impossible to resist! 1. Preheat the oven to 200°C, gas mark 6 and line 2 large baking trays with baking parchment. 2. Pour the sugar onto the tray and spread it out into an even layer. Place into the oven for 5-6 minutes, or until it feels hot to the touch and the very edges of the sugar are just starting to melt. 3. While the sugar is heating up, place the egg whites into a large bowl or bowl of a stand mixer. You’ll need an electric hand whisk or stand mixer to get the volume required for great meringue, don’t try to do it by hand. Whisk the whites until they resemble stiff peaks. 4. Carefully whisk the hot sugar into the egg whites, adding a spoonful at a time and letting each spoonful fully mix in before adding the next. Avoid adding any of the melted sugar around the edges – this will not dissolve properly in the meringue. Turn the oven down to 100°C, gas mark 1. 5. When all the sugar has been added, turn the mixer speed up and whisk for 8-10 minutes or until the mixture is really thick and glossy. If it still feels gritty, continue to whisk for a few more minutes until it feels smooth. 6. Divide the meringue in two then sprinkle cocoa powder in one and dried raspberry in the other. Fold a few times but don’t mix completely to maintain the swirl. 7. Use a tablespoon to spoon large mounds onto the baking trays. Bake for 2–2¼ hours or until firm to the touch, then turn the oven off and leave to cool completely before enjoying on their own or with clotted cream. 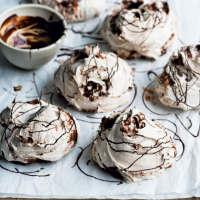 Drizzle the chocolate meringues with the melted dark chocolate before serving.